1865 – Abraham Lincoln’s funeral procession through NYC | Where's Merrill? 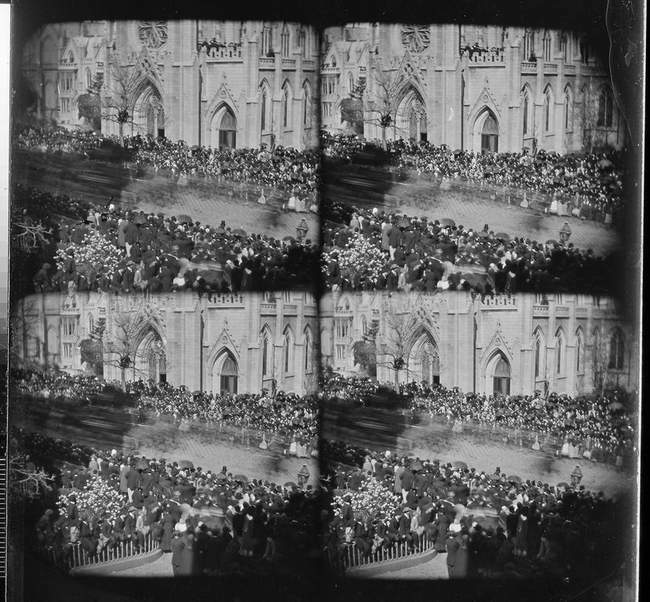 I know … it’s a tenuous link – but if this newly-discovered quad photo really is the work of famed American Civil War photographer, Mathew Brady, then here we have the only known photograph of the momentous funeral procession of Abraham Lincoln’s corpse as it passed through New York City en route from Washington DC to Springfield, Illinois, for burial in April 1865. And … if … this photo was taken outside of the magnificent Grace Episcopal Church on Broadway, then surely my distant ancestor, Patrick Reilly from County Cavan is in the photo. You see, Patrick worked as an Irish immigrant NYC stonemason on the building of the Grace Church, and he lived nearby in 1865. Four years earlier, Patrick answered the call of Civil War recruiting sergeants and enlisted in the 15th Regiment of the New York State Volunteers. He went on to become a Union Army Engineer, building crucial temporary bridges prior to Union advances into Confederate territory. His President, Abraham Lincoln, personally inspected some of Patrick’s handiwork. So … there he is … somewhere in this historic snap created by using a four-lens camera and developed on to a large plate glass negative. This entry was posted in Ancestral Tales and tagged Abraham Lincoln, ancestry, genealogy, New York City by Gearoid O'Neary. Bookmark the permalink.